As the cost of living rises, seniors in San Diego are making difficult choices in order to survive here. 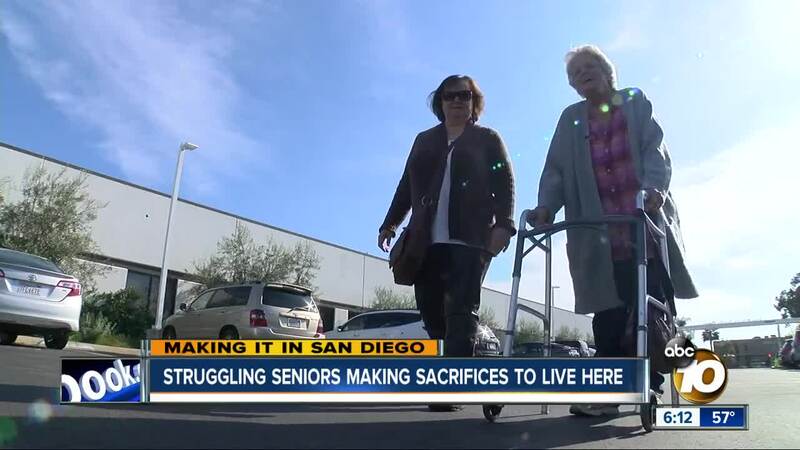 SAN DIEGO (KGTV) - As the cost of living rises, seniors in San Diego are making difficult choices to survive here. From stretching prescriptions to sleeping in their cars, many feel hopeless. “It imploded on me, the cost of food, the rent, transportation," said Deanna Lynn Tomczak, who lived in her car for months. Tomczak is a longtime San Diego resident. When her health started deteriorating, so did many other things in her life. While living in her car, she stayed overnight at the Jewish Family Service Safe Parking Program , where she had access to food, a shower, and a case management team. Jewish Family Service (JFS) is working to keep seniors from falling through the cracks. It took nine months for Tomczak's team to help find her permanent housing. "The kind, the love, the caring, it’s what I needed, and they were here for me," said Tomczak. In addition to the parking program, JFS offers transportation, home-delivered meals, older adult centers, and a pantry of fresh food. Tomczak says the help she received is giving her newfound optimism for the future. To get help from Jewish Family Service , call (858) 637-3210. Older adults can also get access to resources by calling 211 . For mental health and suicide prevention resources, seniors can visit Up2SD.org .